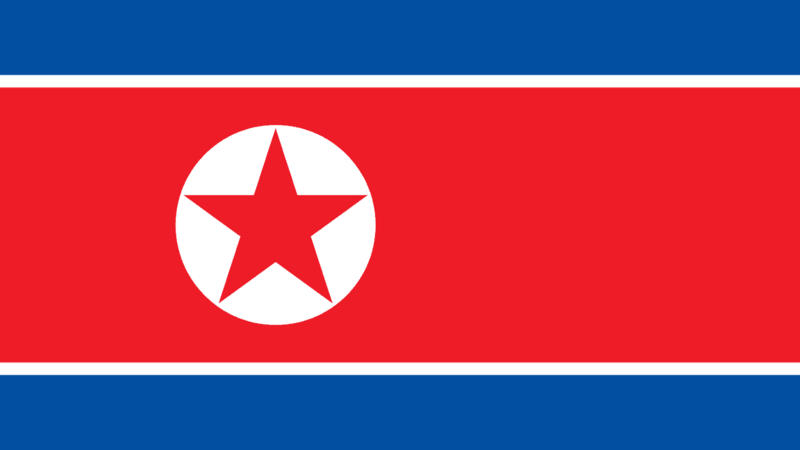 An accurate horoscope for North Korea has never been available to us because there is no recorded time for the proclamation of the Democratic People’s Republic of Korea (DPRK). We do know that independence was declared on September 9, 1948 in Pýongyang, and this date is still celebrated as the national day. I have rectified the North Korea Horoscope to 12:39 pm. For more details see Research data and charts on North Korea. Moon conjunct Ascendant makes North Korea sensitive, insular and reactionary. The citizens identify most strongly with their nation, making them patriotic, devoted, and strongly affected by international relations. The security of the people is of paramount importance for the nation. They were brutalized for 50 years during the Japanese occupation. Then the Korean war killed 300,000 of their soldiers and resulted 1.5 million civilians killed or wounded. Since then, the most powerful military force in the world has been on their doorstep. Saturn square the rising Moon causes isolation, fear and hardship. It makes this already insular and sensitive nation even more defensive and lacking in friends. This also explains the repressive and controlling nature of the dictatorship. A dynastic military dictatorship with Saturn on the fixed star Regulus, “The Crushing Foot”. This is a military star associated with violence, destruction, controlling power and revenge. The Sun and the Midheaven (MC) in mundane astrology both rule the leader. Sun conjunct MC means that the leader totally dominates the national identity, another indicator of dictatorship. Sun square Jupiter causes an inflated ego, exaggeration and lack of restraint. As Jupiter rules trade and treaties, this aspect results in border disputes and trade deficits. Between the Sun and MC, at 16°42′ Virgo, is the Arabic Part of Catastrophe (AC + Uranus – Sun). Venus generally rules peace and diplomacy, but in mundane astrology signifies war in hard aspect. In ancient Mesopotamia, she was the Goddess of Love and Procreation when the evening star, and the Goddess of War when the morning star. In the North Korea horoscope she is Goddess of War, visible before sunrise. The furthest she can ever be in front of the Sun is 48 degrees, so at 46 degrees ahead of the Sun in this chart, she is a very fired up Goddess Ishtar. “her morning appearance woke them up to go to war” [Deborah Houlding]. So an angry Venus woke the North Koreans up at half past two in the morning to go to war. The square from Mars, ruler of the military and war, turns her anger into blind fury. The lunar eclipse before the declaration of independence was at 03°17′ Scorpio, less than half a degree from the North Korean Mars. This increases the aggressive and reactionary nature of the country. 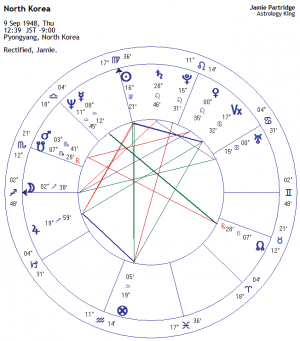 In summary, the North Korea astrology chart is a blueprint for a powerful and aggressive dictatorship, paranoid and out of control. The people suffer through repression, isolation and poverty. The only way for this nation to avert a violent and catastrophic end, is to throw this horoscope in the bin and start over. Full Moon October 2017 in North Korea: After comparing the October 2017 full moon chart set for Pyongyang to my rectified North Korea horoscope I have a feeling something big will happen involving North Korea during the two weeks of this moon phase. North Korea’s reclusive leader Kim Jong-un has invited South Korean President Moon Jae-in to a landmark summit in Pyongyang “at the earliest date possible”, Seoul’s presidential palace said on Saturday. The invitation (February 10, 2018) was personally delivered by Kim’s younger sister Kim Yo-jong as she and North Korea’s ceremonial head of state, Kim Yong Nam, enjoyed kimchi and soju liquor at an unprecedented lunch meeting with the South Korean leader. Mr Moon replied in a positive manner during talks that lasted close to three hours, despite warnings from Washington against falling for Pyongyang’s recent charm offensive. Scheduled departs Singapore 12 June 2018. The horoscopes have the same housecusps degrees in another sequence. Trump Asc. 4 Capricorn, c-2 3 Aquarius, c-3 3 Pisces, IC 5 Aries, c-5 7 Taurus, c-6 7 Gemini, Desc. 4 Cancer, c-8 3 Leo, c-9 3 Virgo, MC 5 Libra, c-11 7 Scorpio, c-12 7 Sagittarius. KJU Asc. 5 Libra = square Trump’s MC 5 Libra, c-2 7 Scorpio, c-3 7 Sagittarius, IC 4 Capricorn, c-5 3 Aquarius, c-6 3 Pisces, Desc. 5 Aries, c-8 7 Taurus, c-9 7 Gemini, MC 4 Cancer, c-11 3 Leo, c-12 3 Virgo. Arabic part AR07 in 17 degrees Pisces. I expect 27 August 2018 very possitive rsults. Trump has on 28 August 2018 progressive Sun trine his radix Black Moon! Moon’s special envoy to visit Pyongyang on Wednesday September 5, 2018. Progressive aspect Kim Jong Un. SEOUL, Sept. 7, 2018 (Yonhap) — The South Korean government will seek to secure the National Assembly’s support for the inter-Korean agreement on rapprochement and cooperation reached at the countries’ leaders’ summit in April, an official from the presidential office Cheong Wa Dae said Friday. The government plans to submit a bill Tuesday on the ratification of the Panmunjom Declaration signed by President Moon Jae-in and North Korean leader Kim Jong-un in their first summit on April 27, Cheong Wa Dae spokesman Kim Eui-kyeom told a press briefing. A Cheong Wa Dae official earlier said the bill will first be reviewed in a Cabinet meeting slated for Tuesday ( Sept. 11). The move comes ahead of Moon’s third bilateral summit with Kim, which is set to take place in Pyongyang from Sept. 18-20. The two leaders held their second meeting on May 26 in the border village of Panmunjom, which was also the venue for their first summit. In the Panmunjom Declaration, Moon and Kim agreed to end the countries’ hostility against each other, saying there must never be another war on the Korean Peninsula. Kim agrees to additional denuclearization steps in summit with Moon. SEOUL/PYONGYANG, Sept. 19, 2018 (Joint Press Corps-Yonhap) — North Korean leader Kim Jong-un agreed to take additional steps for denuclearization Wednesday, in an apparent gesture to restart its stalled talks with the United States. “The North has agreed to permanently shut down its Dongchang-ri missile engine testing facility and missile launch pad under the participation of experts from related countries,” Moon said in a joint press conference with Kim after the summit, broadcast live in Seoul. The North also agreed to take additional steps, such as the permanent shutdown of the Yongbyon nuclear facility, depending on the United States’ corresponding measures, he added. “The South and the North discussed denuclearization steps for the first time,” Moon said. Kim said he and Moon agreed to remove all nuclear weapons and threats from the Korean Peninsula. “The September declaration will open a higher level for the improvement in relations (between the South and the North) … and bring closer the era of peace and prosperity,” Kim said of his agreement signed with Moon after their two-day talks in Pyongyang. The joint declaration, later released by Seoul’s presidential office Cheong Wa Dae, showed the North’s agreement on denuclearization steps. “The North expressed its willingness to continue taking additional steps, such as the permanent shutdown of the Yongbyon nuclear facility, should the United States take corresponding measures under the spirit of the June 12 North Korea-U.S. joint statement,” it said, referring to the agreement reached by U.S. President Donald Trump and Kim in their bilateral summit held in Singapore. Pyongyang is said to be demanding early rewards for denuclearization steps it has taken so far, while Washington continues to stress the importance of maximum pressure and sanctions against the North until the communist state fully denuclearizes. The North’s offer to take additional denuclearization steps despite any signs of reward from the U.S. is apparently aimed at restarting its denuclearization talks with the U.S. The talks have stalled after U.S. President Donald Trump called off a scheduled North Korea trip by his Secretary of State Mike Pompeo, citing what he called a lack of progress in the North’s denuclearization process. Even before the start of his three-day trip to Pyongyang on Tuesday, the South Korean president said the main objective of his trip was to restart the U.S.-North Korea dialogue. Moon insisted the North’s agreement also marked the first time for the Koreas to discuss detailed steps to denuclearization. “I hope the talks between the North and the U.S. quickly resume,” he told the joint press conference. Possibly signaling a breakthrough, Trump welcomed the outcome of the inter-Korean summit in a Twitter message. “Kim Jong Un has agreed to allow Nuclear inspections, subject to final negotiations, and to permanently dismantle a test site and launch pad in the presence of international experts,” he wrote. It was not clear what Trump meant by nuclear inspections. The U.S. is said to have demanded a list of North Korea’s nuclear arsenal and nuclear inspections. North Korea has reportedly dismissed the U.S. demand, an apparent source of the ongoing impasse in the U.S.-North Korea denuclearization talks. Still, Moon’s top security adviser, Chung Eui-yong, insisted the outcome of the latest inter-Korean summit will lead to a resumption of U.S.-North Korea talks. “Based on the outcome of the summit this time, I expect the North-U.S. negotiations to somewhat speed up, and we also hope a North Korea-U.S. summit will be held at an early date,” he told reporters in Pyongyang. Moon is set to visit the United States next week for a bilateral summit with the U.S president. There, he will likely brief Trump on the outcome of his talks with the North Korean leader, and also seek to broker a resumption of the U.S.-North Korea denuclearization talks. The agreement signed by the leaders of the two Koreas in Pyongyang also called for steps to further improve inter-Korean ties. The sides have agreed to begin the work to reconnect their severed railways and roads across the heavily fortified border before the year’s end. Also, the countries will reopen their joint industrial park in the North’s border town of Kaesong and tourism programs to the North’s Mount Kumgang as soon as “conditions are met,” the agreement said. The Kaesong complex was shut down in early 2016 as part of Seoul’s unilateral sanctions against the North. Its reopening, however, may violate international sanctions imposed on the communist state. To further promote reconciliation, the divided Koreas have agreed to soon establish a new joint facility for more frequent and freer reunions of families separated since the end of the Korean War. The two Koreas technically remain at war as the 1950-53 war ended with an armistice, not a peace treaty. In a separate agreement signed by their defense chiefs, the Koreas also agreed to a wide range of steps aimed at further reducing military tension on the Korean Peninsula. Such steps include setting up a 10-kilometer buffer zone along their border where all artillery drills or regiment-level field maneuvers will be prohibited, according to the military agreement. In their joint declaration, the leaders said the countries have also agreed to quickly launch a joint military committee to review their implementation of such tension-reducing measures and to enable round-the-clock communication to prevent future conflicts. The two Koreas will continue to jointly take part in international sporting events, including the upcoming 2020 Olympic Games, the leaders said in their Pyongyang declaration. They will also seek to jointly host the 2032 Summer Olympic Games. The North Korean leader said he has agreed to visit Seoul in the near future. Moon said the near future, barring unforeseen conditions, meant before the year’s end. Following their summit and joint press conference, Moon and Kim continued their dialogue over lunch at Pyongyang’s famous cold noodle restaurant, Okryukwan, according to officials in Seoul. Moon is scheduled to return home Thursday after taking a joint excursion with Kim to North Korea’s Mount Paekdu. The two leaders will embark on the trip early Thursday. Other details of the trip have yet to be decided, according to Kim Eui-kyeom, a spokesman for the South Korean president. Mount Paekdu is the tallest mountain in the whole of Korea and sits at the northern tip of the peninsula on North Korea’s border with China. Moon ratifies Sept. inter-Korean summit, military agreements. SEOUL, Oct. 23, 2018 (Yonhap) — South Korean President Moon Jae-in on Tuesday ratified his summit agreement with North Korean leader Kim Jong-un and an inter-Korean military agreement, both signed in Pyonygang last month. The summit agreement will be published in the government’s official gazette for public notice soon, a Cheong Wa Dae official said. The military agreement will be exchanged with the North before the public notification is made. Cheong Wa Dae spokesman Kim Eui-kyeom said the government expected the exchange to take place early next week. The military agreement, signed on the sidelines of the leaders’ third and latest summit in Pyongyang, seeks to further reduce military tension between the two Koreas. In April, Moon and Kim agreed to seek a formal end to the 1950-53 Korean War during their first-ever summit in the border village of Panmunjom. The birttime of South Korea.is available. The birthtimes of North Korea and Kim Jong Un are not available and are rectified with the Gieles minus 1 system, which gives progressive aspects on date. The Gieles minus 1 system is an easy rectifying system which is unique and revolutionair. 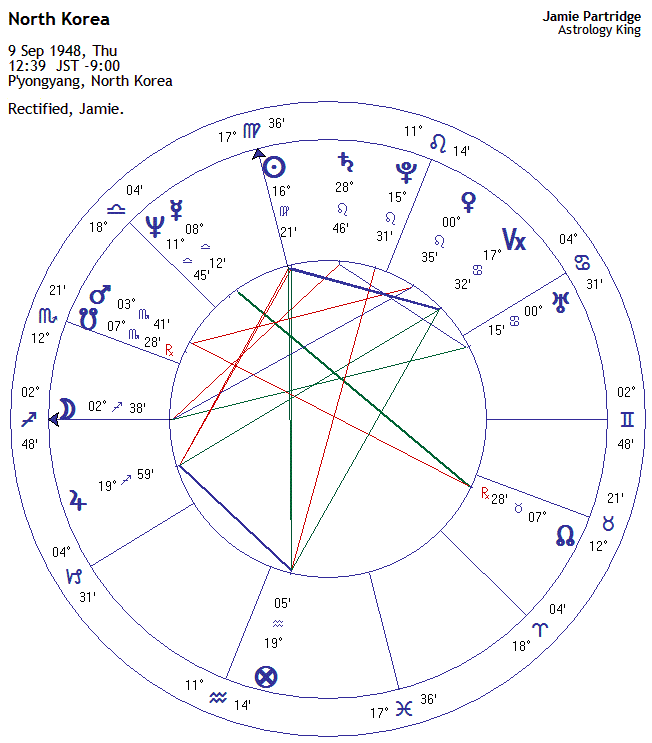 Today 10 March 2019 Kim Jong Un has transit Jupiter conjunct his natal MC 23 degrees Sagittarius. His progressive Sun will be square his natal Chiron on 13 March next.